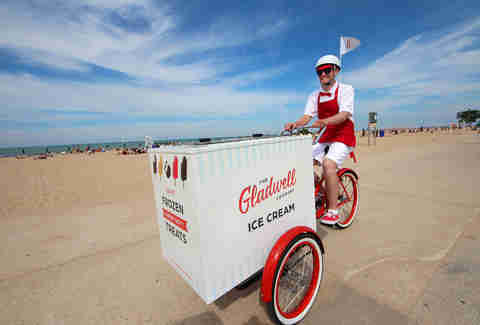 These ladies love this beach-combing ice cream trike. So will you. If you’ve put in any time at the lakeshore, denying the doughy white shame of your Chicago beach body, you’ve likely developed the Pavlovian response of equating bell chimes with push carts hocking freezer-burned Bomb Pops. Enter The Gladwell Company, an ice cream tricycle offering custom-made bars and popsicles like this powered-up fudgsicle called the Cocobar, which uses coconut milk instead of the regular stuff, so it's great whether you’re lactose intolerant or just looking to cool down your own hotness. He's opened with a lineup of five handcrafted treats that includes this Wonderwich: chocolate chip ice cream in-between two chewy chocolate cookies that don’t crack or slip apart. 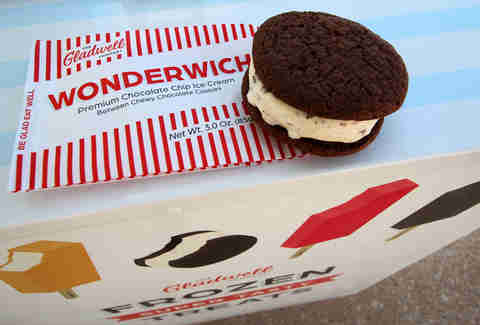 Sway your head and hum "My Cherie Amour" while you eat it, and you’ve got a Stevie Wonderwich. Occasionally, when you’re brandishing a camera near the beach, it attracts a crowd of giggling females eager to strike a pose. (Just us? Maybe invest in a better camera.) This was one of those occasions. Lizzy here is modeling a Dreambar, the most straight-up nostalgic of the popsicles, with vanilla ice cream coated in an orange pop shell. The tricycle’s titular dessert, the Gladbar, has vanilla bean ice cream covered in dark chocolate.